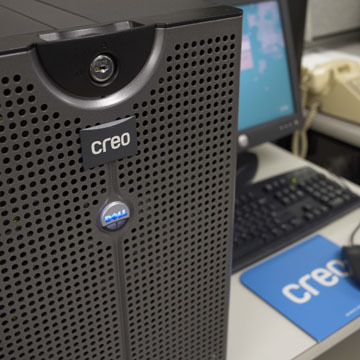 Our Kodak/Creo Prinergy Workflow Systems partnership solves key business issues by streamlining production from original file to final printed job. This translates into improved productivity, resource allocation, and ultimately, your bottom line. Utilizing the latest Adobe PDF Print Engine, transparency issues which plague conventional workflows, are no longer a problem. Complex graphics are rendered flawlessly without flattening. Color matching GRACoL, SWOP is verified and all color systems are in control and calibrated to the latest ISO 12647 standard and G7 Specification. The ISO 12647-7 color control strip is included on all contract proofs for compliance verification. All operator "touches" are recorded and logged for analysis and security in the online Oracle database. This is in addition to a robust archival and retrieval systems utilizing state-of-the-art robotic storage systems. Access to our Insite Portal provides online soft proofing in addition to customer source file access. The Stacatto 10 or 20 micron stochastic screening creates photorealistic prints which differentiate your printed materials from your competition. Finally, your job specifications are routed through CIP3/4* and JDF* which equates to a fast, accurate, high quality production system. Rules Based Automation creates a seamless digital workflow minimizing operator touches and interventions. Digital files can be normalized, imposed and proofs queued without operator intervention. JDF connectivity between Prinergy, job management and EFI RIP and DFE* streamlines digital workflow.